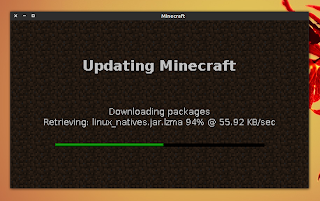 `Unofficial Minecraft Installer` is a script available in a PPA that can be used to easily install the popular Minecraft game in Ubuntu and derivatives (Linux Mint, elementary OS and so on). The Unofficial Minecraft Installer comes with a script that downloads and installs Minecraft (and OpenJDK 7) in Ubuntu-based Linux distributions, an icon created by Cassidy James that should fit perfectly with the elementary icon theme (but not only) and a Minecraft launcher. The package in the PPA is a script that connects to Mojang's servers and downloads the files so there are no actual Minecraft files in the PPA. If your computer has issues running Minecraft with OpenJDK 7, then it will have issues running this. Because that's what this is. I've tested this on multiple machines and it's worked fine, but your mileage may vary. That said, one of the main black screen issues I've seen is people not running it with OpenJDK 7. Once installed, run Minecraft from the menu / Dash, login with your Minecraft account and the installation should start automatically. Alternatively, you can also download the installer via DeviantArt. If you encounter bugs in the installer, report them @ Launchpad. Thanks to Cassidy James for the installer and tip!